The Miami Hurricanes football team lost to the Florida State Seminoles 20-19 Saturday night at Hard Rock Stadium in Miami Gardens, Fla. The ‘Canes came into the game ranked #10 in the nation while the ‘Noles were ranked #23. The result was an upset on paper, but not if we look to history. Miami lost their seventh straight game to Florida State when ‘Canes kicker Michael Badgley’s potential game-tying extra point was blocked. Fittingly, the game’s week-long buildup coincided with the impending arrival of Hurricane Matthew. Countless predictions were made. What path will the storm take? What does Miami need to do to win? Who needs to step up for the ‘Canes? Matthew lingers off -shore. The kickoff hangs in the air. The pressure is palpable. Deafening. The thought of the stadium coming crashing down enters the conscience for a time. First came the thunderous winds. Miami takes a 13-0 lead. Even a third and 19 couldn’t stop the ‘Canes and in fact yielded the first touchdown of the game. Miami quarterback Brad Kaaya floated a perfect pass to wide-receiver Stacey Coley who made an incredible over-the-shoulder catch while managing to keep a foot in bounds. For the second year in a row Coley made a ridiculous touchdown catch against the ‘Noles. That play also came on a third down. The crowd continued to roar. Things were looking good. The rain is crashing down now. Playing with a lead, the defense is rolling. The big boys in the trenches batted down three passes in the first quarter alone. 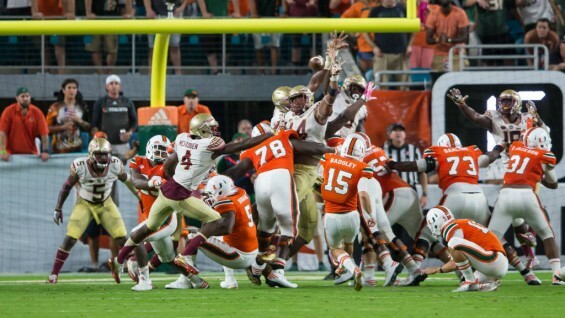 Seminoles quarterback Deondre Francois was struck by a bolt of lightning, taken to the ground by Miami’s Kendrick Norton, and then taken out of the game. Florida State had no room to breathe. And then with one pass, everything changed. The winds died down, the sky dried up, and strokes of the sun poked out miles deep into the horizon. Just like that, the ‘Noles were out of it. On Miami’s first possession of the third quarter, Kaaya threw a red zone interception that seemed to reflect three years of losses at the hands of the ‘Noles. In 2014 the ‘Canes donated a 16 point lead to Florida State’s cause, while a fourth-quarter lead last year proved to be as transient as a Miami sunshower. It was an inexcusable pass, thrown short to the corner of the endzone and placed perfectly for the defensive back. 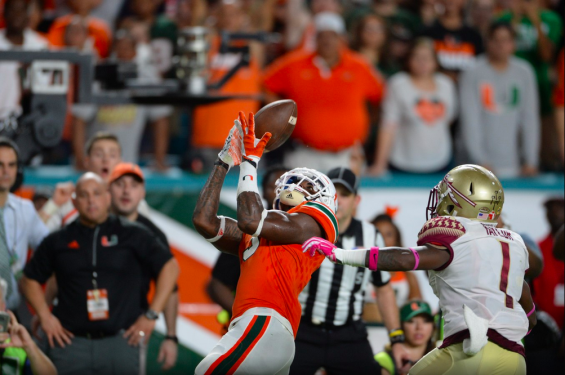 Florida State’s Tarvarus McFadden played it so effortlessly it seemed as though Miami ran the play for him. Florida State’s storm had passed as Miami’s just begun. The Miami defense was quick to heed the evacuation warnings. A unit that dominated the ball and the line of scrimmage in the first half was nowhere to be found, phones dead and unable to be charged from the loss of power, their GPS locations rendered invisible. Hoping the storm warnings were just that and nothing more, Florida State runningback Dalvin Cook represented the ‘Canes worst fears. Cook opted to halt his off-shore loitering and veer inland, taking advantage of the wide-open spaces left by the now-sheltered ‘Canes defense. Just like Matthew did up Florida’s coast, Cook’s damage increased as the game wore on as he finished with 150 yards. The result? Twenty straight points for the ‘Noles. Two ‘Canes players didn’t even make it to the stadium. Unlike the hometown defense, Miami runningbacks Mark Walton and Joseph Yearby were already inside by the time the winds started to blow their way. They listened to the warnings to stay indoors as both backs managed only 39 yards a piece, a far cry from the hundred-yard days of previous games. In a game when controlling the tempo could’ve been the difference, the absence of the running game was too much for Kaaya and the rest of the offense to overcome. And yet, hope manifested itself in the form of a shanked punt and quality return by ‘Canes wideout Braxton Berrios. Maybe the sun was going to shine on Miami after all. The ‘Canes had the ball at the Seminole 16-yard line. Kaaya proved how ridiculous his earlier interception was when he lofted a perfect pass for Coley on fourth and five for a touchdown. Miami was back. They were going to kick the extra point and prevail in overtime, the winds suddenly whipping at their backs. Saturday, however, recent history was not to be ignored. That final storm never materialized. The extra point was blocked, a perfect encapsulation of the last seven years of this rivalry: In the end, Miami didn’t have enough. The No. 16 Hurricanes face off against the North Carolina Tar Heels Saturday at Hard Rock Stadium at 3:30 p.m. The game will be broadcast on ABC. Last year, the ‘Canes were thrashed by the Tar Heels 59-21.